No matter what it is called – formal night, elegant evening, evening chic, gala evening, dress-up night – you always want to look your best for this special night of your cruise vacation. This is especially true when portraits and pictures are involved, whether it will be a casual snap with your phone, group shots on the grand staircase, or striking a pose with different backgrounds or props. But when you don’t have your entire wardrobe, personalized makeup counter, or all your favorite salon products packed in your stateroom, how can you be sure you’re camera ready? First, learn when your cruise will have its formal evenings, and bear in mind that while there may be more than one, the first formal night is generally the grandest with the most photo ops. Knowing when your formal night will be is essential so you don’t get sunburned or show drastic tan lines or peeling skin for your elegant photos. Also avoid any dramatic in-port appearance changes – a temporary tattoo or elaborate hair braids may be fun on shore, but will you want to see those accents in formal portraits? Your outfit needs to stand out for formal night, but you have to be comfortable wearing it. If your dress or suit jacket is a bit tight before the cruise, it may be much tighter and fit poorly after even a few days of indulgent food and little exercise. Instead, opt for attire you feel confident and attractive wearing, that you know flatters your shape, skin tone, and hair color. It can also help to pack along several sets of accessories so you can pick and choose which ones work best on the day. You will look better and your portraits will reflect it if you are relaxed and stress-free on formal night, instead of worrying about your appearance. Take a nap earlier in the day, consider getting a massage in the afternoon, or opt for a salon appointment to be sure you are refreshed and your hair and makeup look their very best. This goes for gentlemen as well – a nice massage or double-close shave can help any guy be model-worthy for formal night portraits. Book appointments early, however, as time slots just before formal evening can fill up quickly. 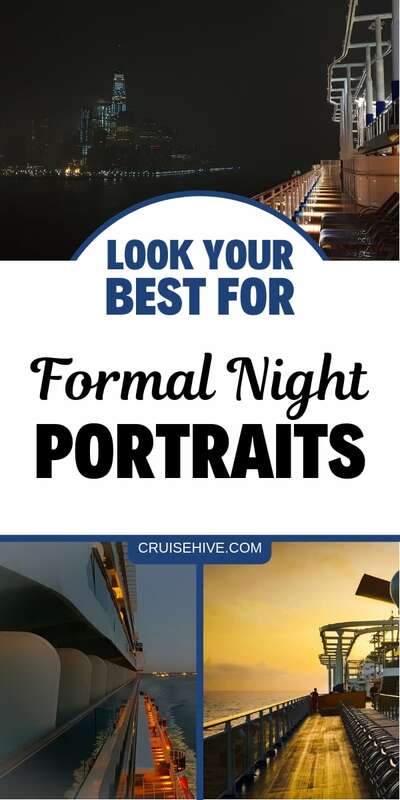 Most larger cruise ships with thousands of passengers and multiple dining times will have several photo sessions on formal night, but you will look better in each portrait if you take your photos first – before dinner. That way, your hair and makeup are as fresh as possible, and there are no unexpected wrinkles or stains on your outfit from dinner. Lines for different photo stations are also shorter at earlier sessions, so you can take more photos without feeling rushed or impatient. Taking photos earlier also gives you the opportunity to revisit photo stations later on for retakes if you’re not sure about your first poses. Cruise ship photographers are very experienced with helping you strike the best poses and adjusting posture, angles, and lighting to help you look amazing in every photo. When you’re ready to pose, listen to their instructions and feel free to take more photos than you first considered, since you never know which photo may turn out to be your best. There is no cost or sitting fees to take portraits, and you are not obligated to purchase any, so feel free to make the most of the opportunity. At the same time, be patient with couples, groups, and individuals ahead of you in line as they take their own photos – there will be ample opportunities for everyone to strike their best pose. Of course, you always need to trust yourself. If there is a pose you know you won’t like – a profile angle, for example, or posing with some quirky prop – don’t feel like you have to take the photo. Instead, try an alternative pose or an angle you know is flattering for you. But at the same time, don’t be afraid to be a little silly. It may be formal night, but it can still be fun, and you never know which photo you will like the best. You may find that the quirky photo or unexpected pose is your very best cruise souvenir!